Our annual Spring Fling Fair! This year we are featuring a new Midway Provider! 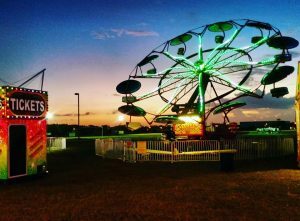 We will have some of the ‘classic’ rides this year – like the bumper cars, the Ferris Wheel, and more! Parking is always free, and there is a $5 entry fee. Unlimited ride arm bands will be available – and we will have that amazing fair food! Wednesday May 1 will be Car Load Special night AND our annual EC Day at the Fair- more details to be posted soon.